does your armor have working parts if so post some pictures! some kindof of cable launcher(i can probably at least make it dispense a cable. and last but not least a lite up display on armor wont do much just flash. I soooo need the flame thrower if I have to make creme brulee. It would also be handy for soldering. And you could use the cable launcher as a tape measure if you marked it off in increments. Your title will be New Member till you post a certain amount of times. Like I've posted over 1,000 posts, that's how I got my title. We don't choose our own, but getting higher post counts gets you a new rank. can easily be blown back at you or someone else. so im still going with gas since theres almost no windy days where i live. Hmmm, isnÃ¢Â€Â™t that the point? Just kidding. The problem with gas (i.e. propane) is that it is generally quite difficult to get your flames to go more than about 3 or 4 feet. Now IÃ¢Â€Â™m not saying it canÃ¢Â€Â™t be done itÃ¢Â€Â™s just a lot harder. But a liquid under pressure can shoot a lot farther. The military type flamethrowers use both a flammable liquid and a compressed gas such as propane or butane. When mixed together properly it works....quite well. However it's on my costume waiting list, and somehow keeps getting pushed farther and farther down it, so I'm not sure when I'll start on that one. U could put a cell phone lcd screen in the range finder, but how how u could hook up a mini camera to the scope without using wires, I have no idea. wow it sounds great,next we can have reall mandalorians . 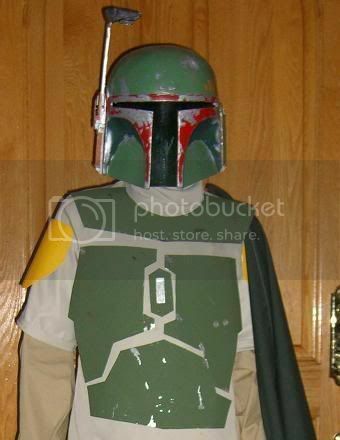 oh and heres some pictures of my costume from haloween and yes im going to repaint the armor but sweet helmet huh? how do you plan on making the whipcord work. i would really like to know. i was thinking of using my compressed air tank for my paintball gun and rigging up a hose where the whip cord will shoot out. i just need to find out how to make it shoot and be able to have a long cord on it. any ideas. let me know if thats what u were thinking. i was also thinking about making the gun actually working as well maybe get a cheap paintball gun or airsoft rifle and make it look like the actual blaster. let me know if my ideas are at all possible. It's not just about making a rope shoot, the problem is making it twist around by itself. Besides I gave this project up a long time ago. At the most I'd make a dart shooter. Making it wrap around things is actually one of the stupid things I noticed in the movie. There is no reason that it would happen. If he shot it out on an angle it would logically bend around something, but when he wraps up Luke or when Jango grabs Obi-Wan's leg... I laughed to myself. Well it would be possible to make it wrap around things but it would take some pretty sophisticated technology. i bought the working flame thrower instructions off ebay but i got ripped because the gauntlets shape is really dumb!!! does anyone know how to make gauntlets if so do reply???! !